Before I started the 75-day challenge, I was “stuck”. I had weight to lose but nothing was happening. I had dabbled with counting calories, and exercising a ton but I just couldn’t pull it all together on my own. I was frustrated. Having babies is hard and it seems to get harder each time. I was on #3 and my weight hadn’t moved in 6 months! I remember moments where I would freak out a little, afraid that I was stuck in my postpartum body forever. I started to think I would just have to accept that I was getting older and my metabolism had changed. 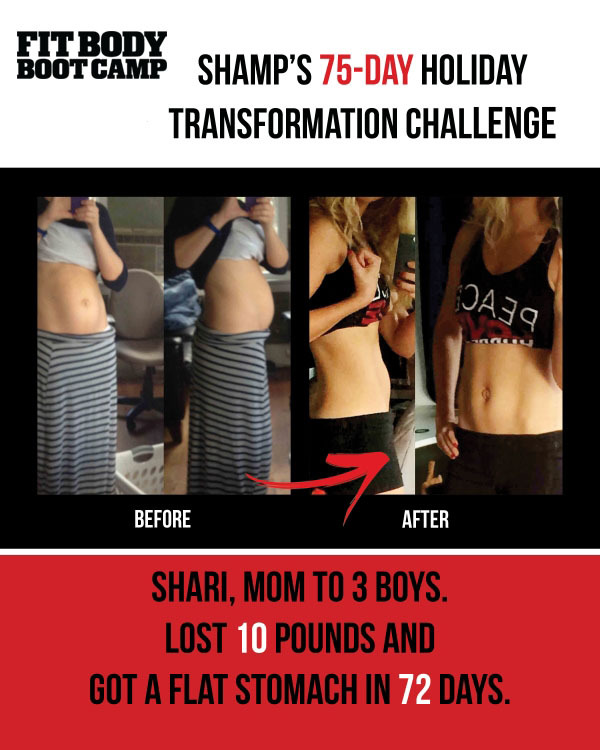 The 75-day challenge helped everything finally come together. Changing my diet was huge for me! I eat healthy foods, I would die without mounds of veggies, but I have a sweet tooth and I love milk too! I did the recommended elimination diet and I couldn’t believe the transformation I witnessed by cutting out inflammatory foods! Once I gained more discipline over how [and what] I ate, the scale started to move and I felt more motivated to improve my physical performance. I ran most mornings to and from boot camp and ran the longer weekend trail runs as well. My first trail run was only 2 miles and I remember feeling like I could die! But sooner than I thought, I was surprised to see large gains in my strength and speed. I ran the 8-mile Sacramento Spartan race and completed 19 out of the 20 obstacles without any burpee penalties! Rope climbing, monkey bars–things I couldn’t have done before the challenge! The best part of all is I feel strong and my metabolism is on fire! I feel very grateful. I still have work to do and a few more pounds to go but I now see that I’m not “stuck” with 20 extra pounds or with a slow metabolism forever!